Castors are everywhere, in fact, they’re so common and ubiquitous, it’s likely you’ve not noticed them in some of the most obvious places. You might find you have them all around your house, on furniture, fridges and cupboards, but they’re also used in large numbers in industry and other places such as hospitals. They certainly make moving people around on beds a lot easier. But what goes into making a castor? What are the components and what do they do? Well, some of the below items make up some pretty typical castors, although obviously not all will be found on all castors due to the specialist nature of some of them. The mount is what attaches the castor to the bottom of the object in question, and they’re usually one of two types. 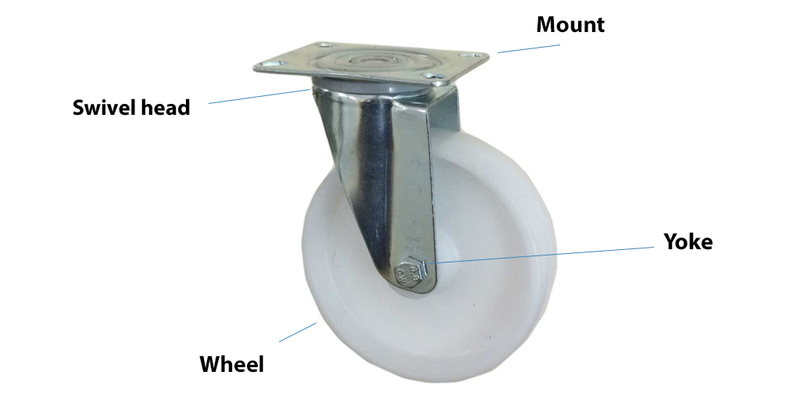 In heavy duty situations, you’ll often find castors mounted using a plate which is screwed, bolted or welded to the target, but where manoeuvrability and ease of fitting is more important, a scree or snap-on stem may be used. The beauty of castors is often that the object they’re attached to can be easily moved in any direction, which means they have a swivel head that will allow for 360-degree directional movement. The yoke simply holds the wheel in place and together with the swivel head allows for full movement. In some cases, there’s a need to absorb vibrations as much as possible in which case you may find a spring mechanism in place that uses a coiled steel spring to absorb shocks. However, hydraulic or elastomeric springs can also be used depending on the requirements. These can be made of many different materials such as rubber or polyurethane, but they can also be steel or pneumatic. The bearings are there to ensure the wheel runs smoothly. This is what secures the axle to the yoke and the material used will have a lot to do with the environment.